So what does that mean exactly? This means that now when you run conversations in one of the below languages, similar responses will be effectively grouped together during the Remesh platform's analysis of participants' answers. 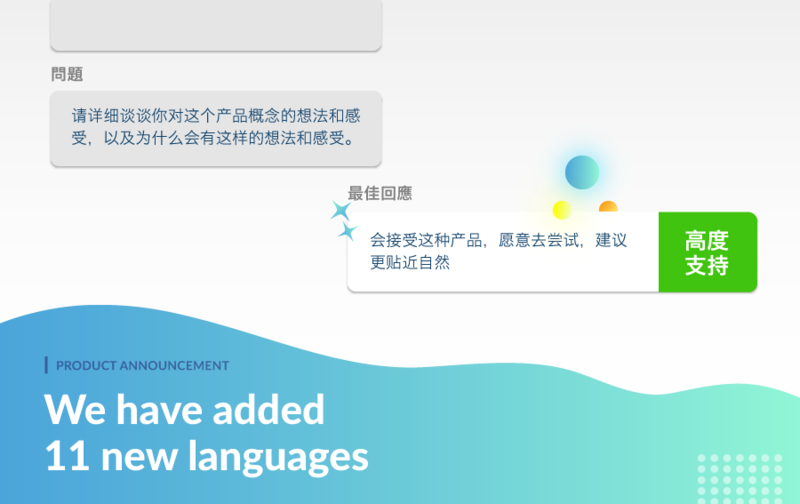 By focusing on adding our latest capabilities in natural language processing to additional languages, we are making it easier to understand even more groups of people and setting up the next wave of our advanced data science tools to be more inclusive to understanding diverse groups of people. Eventually we want to be be able to understand all people, but with these 11 languages + English, we are excited to be able to understand almost 37% of the world in their first language! To take advantage of this new functionality, just select the language you want the conversation to be in when setting up a conversation from the drop down list. The advanced language processing will automatically be turned on and set to interpret your chosen language. If you were impressed with your cousin who moved to France's ability to speak 3 languages, you will be saying "c'est magnifique!" to Remesh's new 12-language capabilities. If after you choose the language, you want to turn off the advanced language processing for any reason, just go to your Settings tab in the conversation menu and deselect ‘Enable NLP Features.’ Voila! Don’t hesitate to reach out to your Customer Success wizard at Remesh if you have any questions!